TV: The Big Bang Theory 6x12 Promo "The Egg Salad Equivalency"
"The Egg Salad Equivalency" -- Sheldon gets accused of sexual harassment at the University and winds up getting Leonard, Raj and Wolowitz in trouble, on THE BIG BANG THEORY, Thursday, date (8:00 -- 8:31 PM, ET/PT) on the CBS Television Network. Regina King guest stars as Mrs. Davis, the University's Director of Employee Relations. "Boom De Ya Da" -- Will's latest case -- which could net the firm millions -- hangs in the balance as Alicia navigates Louis Canning's attempts to delay a deposition crucial to Will's argument. Meanwhile, Will and Diane make a stand against Clarke, and an old foe complicates things for Eli, on THE GOOD WIFE, Sunday, January 6th on CBS. Michael J. Fox returns as Louis Canning and T.R. Knight guest stars as Jordan Karahalios, a political advisor who joins Eli on Peter's campaign. TV: Two and a Half Men 10x12 Promo "Welcome to Alancrest"
"Welcome to Alancrest" - Using Walden's money, Alan invests in Kate's fashion line. Meanwhile, leading a double life starts to take its toll on Walden, on TWO AND A HALF MEN, Thursday, January 3rd on CBS. TV: CSI NY 9x11 Promo "Command+P"
"Command+P" -- The CSIs are confronted with a puzzling mystery when two different victims are linked by the same unusual weapon, on CSI: NY, Friday, January 4th on CBS. TV: The Mentalist 5x11 Promo "Days of Wine & Roses"
"Days of Wine and Roses" — The CBI team visits a high-end California rehab center in order to investigate the death of a young model who was a patient there, while Lisbon ramps up her investigation into Tommy Volker, on THE MENTALIST, Sunday, January 6th on CBS. Henry Ian Cusick returns as multi-millionaire Tommy Volker. Mary Lynn Rajskub guest stars as a rehab patient. TV: Elementary 1x11 Promo "Dirty Laundry"
"Dirty Laundry" -- Sherlock and Joan investigate the murder of the general manager of a high-end Manhattan hotel whose body is found inside an industrial laundry machine. Meanwhile, since Joan's time with Sherlock is almost up, he offers her an apprenticeship, on ELEMENTARY, Thursday, January 3rd on CBS. TV: Modern Family 4x11 Promo "New Year's Eve"
Modern Family starts the new year with a good first impression. Guest stars Elizabeth Banks, Billy Dee Williams, and Nathan Lane and lots of milestones. A first kiss, a mother-in-law, a wedding, and the miracle of life. Modern Family returns January 9th on ABC. TV: American Idol Season 12 Promo "Be Surprised"
Be surprised, be blown away, be there from the beginning. It's back - American Idol Season 12 premieres Wednesday January 16th on FOX. Tina Fey and Amy Poehler host the 2013 Golden Globe Awards, Sunday January 13th on NBC. These hilarious ladies were also nominated in the Best Actress In A Comedy Series category. Tom Daley splashes onto ITV1 in a brand new entertainment series that pitches celebrities against each other as they prove what goes up must come down and learn to dive. Featuring Olympic Bronze medal and British and European Championship winner Tom Daley, Splash! challenges some of the nation's favourite faces to learn one of sport's most difficult disciplines. There's an explanation for this, and a reason for this. And this isn't what it looks like. Get all the answers when New Girl returns on Tuesday January 8th. TV: Once Upon a Time 2x10 Promo #3 "The Cricket Game"
They were transported to a town they couldn't escape. This January, the curse is broken and the most famous fairytale characters are free to enter our world! Once Upon a Time returns January 6th on ABC. TV: The Office 9x10 Promo "Lice"
Pam accidentally brings lice into the office but lets Meredith take the blame; Jim spends a great day in Philadelphia with a potential business associate; Nellie, Phyllis and Kevin interfere with Darryl's love life. TV: Person of Interest 2x11 Promo "2πR"
"2πR" -- Finch goes undercover as a high school substitute teacher to protect a teen genius POI as Carter undertakes a dangerous mission to stop the FBI from determining that an imprisoned Reese is the "Man In a Suit," on PERSON OF INTEREST, Thursday, January 3rd on CBS. TV: Once Upon a Time 2x10 Extended Promo "The Cricket Game"
"The Cricket Game" - Regina is accused of murdering one of the town's most beloved fairytale characters -- but only Emma senses that she may be innocent. Meanwhile, back in the fairytale land that was, after capturing the Evil Queen, Snow White and Prince Charming set about planning her public execution in order to rid the land of her murderous tyranny, on "Once Upon a Time," Sunday, January 6th on ABC. Celeb: Is Britney Spears Getting Fired from X Factor? TV: The Mob Doctor 1x11 Promo "Sibling Rivalry"
When a champagne bomb is delivered to Constantine, he and Celeste (guest star Jennifer Beals) go on high alert to determine who wants him dead. Meanwhile, Nate turns to Grace after he accidentally jeopardizes a mobster's valuable racehorse. Back at Roosevelt Medical Center, Grace is tapped to treat Brett's (Zach Gilford) estranged brother, Jack Hanson (guest star Derrick Trumbly), following a severe cycling accident in the all-new "Sibling Rivalry" episode of THE MOB DOCTOR airing Monday, December 31 on FOX. TV: The Mindy Project 1x11 Promo "Mindy's Brother"
The new year means new beginnings, and a new chance at love. The Mindy Project returns with all new episodes Tuesday January 8th on FOX. Tuesday January 8th it's out with the old and in with the New Girl. The hit comedy series that was nominated for two Golden Globes returns to FOX with all new episodes. Jess Up Your January! TV: Law and Order SVU 14x10 Promo "Presumed Guilty"
"Presumed Guilty" - Detective Tutola (Ice-T) gets entangled in a church scandal when his ex-brother-in-law (guest star Erik Laray Harvey) is arrested for the brutal attack of a priest (guest star Denis O'Hare) just days before Christmas. TV: Castle 5x10 Promotional Photos "Significant Others"
TV: The Neighbors 1x11 Promo "Gingerbread Man"
BBC Radio 1's brand new request show hosts take half of McFly on a fantastical intenserview-assisted journey through what Christmas means to them, as told by pieces of generic plastic construction toys. Dancing on the Edge is set in the early 1930s and follows black jazz musicians, the Louis Lester Band, as they find fame amongst the parties and performances of London's upper class society. Celeb: Piers Morgan Threatened with Deportation? Get a behind the scenes look at the third season of Shameless with interviews from the cast. Shameless Season 3 premieres January 13th on Showtime. ‎Monday Mornings follows the lives of doctors who face the cold fact every Monday morning. The all new series from David E. Kelley (Boston Legal, Chicago Hope, The Practice) premieres Monday, February 4th on TNT! Don't miss this holiday gift from Community -- an exclusive sneak peek! Watch the Season Premiere Thursday, February 7th at 8/7c on NBC. TV: Fringe 5x11 Promo "The Boy Must Live"
As time dramatically ticks down toward the end of this acclaimed series, Peter, Olivia and Walter stop at nothing to save the universe from Observer rule. Walter enters the infamous deprivation tank in an attempt to uncover a key piece of information about the mysterious figure, Donald. Meanwhile, Captain Windmark sets out on a revealing mission of his own as long-standing questions are answered in the all-new "The Boy Must Live" episode of FRINGE airing Friday, January 11th on FOX. Gaming: Wii U - Kasumi joins NINJA GAIDEN 3: Razor's Edge! TV: Scandal 2x10 Promo #2 "One for the Dog"
This year, Scandal has brought you the most shocking buzzed about moments on network television. On Thursday January 10th, the heart-pounding drama isn't even close to being over! TV: Glee 4x11 Promo #2 "Sadie Hawkins"
In an upcoming documentary, the Spice Girls star speaks about being dateless, being dubbed 'Posh' and how people just wanted to brush her hair. TV: The Vampire Diaries 4x10 Extended Promo "After School Special"
TV: American Idol Season 12 Promo "Superstar Judges, Superstar Talent"
TV: Revenge 2x10 Sneak Peek #1 "Power"
Actress Helen Flanagan became emotional today as she apologised for posting a "careless" tweet, showing a photograph of herself holding a gun to her head - on the same day the first of the Sandy Hook massacre victims were buried. Speaking on ITV1's Daybreak, the former Coronation Street actress said posting the photograph was the "most stupid thing she had ever done" in her life and apologised for her actions. Silly mistake or publicity stunt?? She tweeted the friday about the sandy shooting, yet thought it appropriate to post a picture of her with a gun to her head. TV: The Americans (FX) Action Promo "All Is Fair In Love and Cold War"
See the gunfights, brawls, car chases, and explosions in this new action packed promo for FX's upcoming series The Americans, premiering in January. Starting today and through Jan. 10, 2013 you can get a free downloadable lesson for Art Academy: Lessons for Everyone! that teaches you how to draw a Goomba! Check out this trailer. TV: Chicago Fire 1x11 Promo "God Has Spoken"
Eaten up by his guilt over Flaco's death in the fire, Cruz (Joe Minoso) goes to Casey (Jesse Spencer) to confess. While Shay (Lauren German) recovers from a head injury sustained in the ambulance crash, Severide (Taylor Kinney) asks Dawson (Monica Raymund) for her help in dealing with his own injury. Casey is caught in the middle of a family conflict between his mother (guest star Kathleen Quinlan) and sister (guest star Nicole Forester). Elsewhere, Herrmann (David Eigenberg) finds a business deal hard to stomach. Charlie Barnett and Eamonn Walk also star. Sarah Shahi guest stars. TV: It's Always Sunny in Philadelphia 8x10 Promo "Reynolds vs. Reynolds"
Court is in session at Paddy's Pub as Frank and Dennis present their cases to the rest of the gang, resulting in a verdict that will change their lives FOREVER...but not really. TEXAS CHAINSAW 3D continues the legendary story of the homicidal Sawyer family, picking up where Tobe Hooper's 1974 horror classic left off in Newt, Texas, where for decades people went missing without a trace. The townspeople long suspected the Sawyer family, owners of a local barbeque pit, were somehow responsible. Their suspicions were finally confirmed one hot summer day when a young woman escaped the Sawyer house following the brutal murders of her four friends. Word around the small town quickly spread, and a vigilante mob of enraged locals surrounded the Sawyer stronghold, burning it to the ground and killing every last member of the family -- or so they thought. PITTSBURGH (KDKA) — A social media effort to help a local boy fighting cancer meet his favorite WWE superstar came true Tuesday night. Not only did he attend the WWE Raw event at CONSOL Energy Center, he got up close and personal with Daniel Bryan. It all started with a YouTube video of 7-year-old Connor Michalek making a plea to meet his all-time favorite WWE wrestler, Daniel Bryan. The Shaler Township boy was diagnosed with cancer of the brain and spine when he was just 3-years-old. He’s had multiple surgeries and several rounds of chemotherapy. Word of Conner’s desire to meet the WWE star spread like wildfire on social media and local radio stations. And on Tuesday, Conner’s wish to meet Bryan and put him in his signature “no lock” position came true. “It kinda brings a tear to my eye to know somebody like Connor wants to meet somebody like me, so that’s kinda cool,” said Bryan. Doctors gave Connor a less than one percent chance of survival. But you wouldn’t know it by his infectious personality. “Well, they call me ‘Stone Crusher,’” says Conner. Nothing seems to dampen his spirits as he’s truly a champion for bravery. While Conner is known as “Stone Crusher,” Connor’s younger brother, Jackson, calls himself “Jack the Ripper” when they’re playing wrestling with their video games at home. Visit http://www.findralph.com to complete the missing Ralph poster for a chance to win a GALAXY Note II and exclusive goodie bags. Also enjoy games and videos to learn more about the GALAXY Note II and the Wreck-it Ralph characters. TV: Private Practice 6x11 Promo "Good Fries Are Hard to Come By"
When two doctors cross the line, someone is going to get burned. Private Practice season 6 returns on January 8th and there's only three episodes left until the series finale! NASA Johnson Style is a volunteer outreach video project created by the students of NASA's Johnson Space Center. It was created as an educational parody of Psy's Gangnam Style. The lyrics and scenes in the video have been re-imagined in order to inform the public about the amazing work going on at NASA and the Johnson Space Center. Celeb: Why Is David Walliams Hoping His Baby Won't Look Like Him? Celeb: Why Is Simon Cowell Reportedly Flying Back To the UK? Dr Who, aka Matt Smith, and his new assistant Jenna-Louise Coleman drop by the Radio 1 Breakfast show and answer listeners questions. Find out how Matt gets his quiff to stay put, what the most annoying question to be asked is and what Dr Who wants in his Christmas stocking! TV: Dancing on Ice 2013. 6th January on ITV. Maggie and Walt are that couple that were just made for each other. But sometimes, even the sweetest love story can have an unexpected twist. Having a close family comes with some challenges - and fighting is one of those. The Carrie Diaries premieres on CW this January. They say the first time can hurt, sometimes in more ways than one. The Carrie Diaries premieres Monday January 14th on CW. Amy and her pals are back in an all new season of "Enlightened." The new season premieres Sunday, January 13 at 9:30PM only on HBO. They're just a typical family living in a typical neighborhood. 1600 Penn premieres Monday after The Voice on NBC. Do No Harm centers around a brilliant neurosurgeon who has to battle his own alter-ego so that he can live a normal life. Steven Pasquale ("Rescue Me") stars as Dr. Jason Cole. To celebrate the release ofPeep Show - Series 8 on DVD on 26th December we have a great competition for you. Up for grabs are 3 copies on DVD! All six episodes from the eighth series of the Channel 4 comedy chronicling the private - and totally dysfunctional - inner thoughts of two flatmates, Mark (David Mitchell) and Jeremy (Robert Webb), living in post-credit-crunch Croydon. In this series, we find out whether Dobby (Isy Suttie) will move in with Mark or if she'll choose to live with Gerard (Jim Howick) as Mark fears. After all, she's been spending so much time looking after him; and Jeremy begins making regular visits to a therapist after realising that his life isn't amounting to very much. 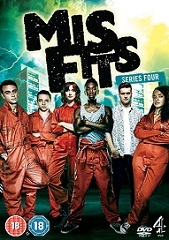 To celebrate the release of Misfits - Series 4 on DVD on 26th December we have a great competition for you. All eight episodes from the fourth series of the E4 comedy drama following a gang of teenage outsiders who find themselves saddled with superpowers after getting caught up in a storm. In this series, new characters Jess (Karla Crome), Finn (Nathan McMullen) and Alex (Matt Stokoe) are introduced, joining Curtis (Nathan Stewart Jarrett) and Rudy (Joe Gilgun) as they struggle to fend off a six-foot killer rabbit and the Four Horsemen of the Apocalypse. Who plays Jess in Misfits? To enter Email us with your answer, along with your name and address. When the competition ends as indictated on this page, any and all entries received after this point will not count and emails blacklisted due to not checking this page first. Everything is bigger and better in Dallas. Critics rave: addictive, fresh, superb, and hard to resist. This season of Dallas is hotter than ever! Dallas season 2 premieres January 28th on TNT. Road Dogg and Josh Mathews have shared some awful videos with the WWE Universe, but nothing as foul as this clip from WCW Thunder. See the #garbagejuice only on "Are You Serious?" exclusively on YouTube! High in the mountains a great horde gathers; Morgana prepares for war, a vengeful Mordred at her side. Merlin feels the weight of his destiny like never before as the ancient prophecies play out with terrifying accuracy. Yet before he can save his beloved Camelot, he must save himself. TV: Fringe 5x10 Promo "Anomaly XB-6783746"
As the countdown to the climactic series finale continues, the Fringe team is running out of time to save the world. As Peter, Olivia, Astrid and Walter scramble to tap into a key piece of the puzzle to defeat the Observers, they enlist the aid of Nina Sharp who conjures up a plan on an all-new "Anomaly XB-6783746" episode of FRINGE airing Friday, December 21st on FOX. TV: How I Met Your Mother 8x11 & 8x12 Promo "The Final Page"
"The Final Page" Part 1 and 2: Robin takes steps to have Patrice fired from WWN, while Marshall puts a jinx on Barney. Later, Ted invites his architecture professor to the dedication of the GNB building; and Marshall and Lily bump into an oddball acquaintance from college. Christmas approaches and Ted wrestles with whether to tell Robin about Barney's intentions involving Patrice, while Marshall and Lily get an early Yule gift, a night away from Marvin, but a case of separation anxiety strikes and threatens to ruin the evening. The actress' signature features are immortalized in a stunning statue. See Jennifer's "twin" at Madame Tussauds in New York. TV: Leverage 5x14 Promo "The Toy Job"
It's all fun and games until the Leverage crew toys with a new target. Watch them steal Christmas, Tuesday December 18th on TNT! Check out this haunting acoustic version of Justin's hit song, performed exclusively for Ellen's audience. TV: The Americans (FX) Teaser #4 "Sniper"
This January, pledge your allegiance. The Americans series premiere is Wednesday January 30th at 10pm on FX. Keri Russell and Matthew Rhys star as a suburban Washington couple who are secretly KGB spies. Let Abbey Clancy, Shakira, Irina Shayk and more show you why being a footballer IS the 'best job in the world'. Try to not to pass out with sheer excitement. TV: Scandal 2x10 Promo "One for the Dog"
TV: Beauty and the Beast 1x10 Promo "Seeing Red"
TV: Grey's Anatomy 9x10 Promo "Things We Said Today"
TV: Glee 4x11 Promo "Sadie Hawkins"
TV: The Vampire Diaries 4x10 Promo "After School Special"
The originals are back and they are thirsty! Now the war begins in the epic return of The Vampire Diaries, Thursday January 17th on CW. Suits returns with all new episodes, Thursday January 17th on USA Network! TV: 2 Broke Girls 2x12 Promo "And the High Holidays"
Desperate for a way to pay their overdue rent, Max and Caroline get involved with a group of of sketchy customers willing to pay top dollar for their cupcakes. GOSSIP GIRL IDENTITY REVEALED IN SERIES FINALE -- The Series Finale begins with the stars and executive producers bidding farewell to the Upper East Side in a look back at the show's many unforgettable moments. Then, in a fashionable farewell to remember, our favorite Upper East Siders join forces for one last soiree, and the shocking identity of Gossip Girl is finally revealed. TV: Chicago Fire 1x10 Promo "Merry Christmas, Etc." After putting out a kitchen fire in an upscale townhouse, Casey (Jesse Spencer), Herrmann (David Eigenberg), Mouch (Christian Stolte), Cruz (Joe Minoso), Otis (Yuri Sardarov) and Mills (Charlie Barnett) find themselves accused of stealing a $50,000 diamond necklace from the home, touching off an internal investigation. Cruz's brother Leon (guest star Jeff Lima) is caught in the middle of an escalating gang war, leaving Cruz to make a desperate choice to save him. Meanwhile, Dawson (Monica Raymund) invites Casey to her cousin's fancy Christmas party, and a frustrated Shay (Lauren German) has reached her limit with Severide (Taylor Kinney). Eamonn Walker also stars. While Arden concludes his experiments, Howard meets Mary Eunice's inner self and Kit has an unexpected reunion. American Horror Story Asylum returns January 2nd on FX. TV: Arrow 1x10 Promo "Burned"
Dr. Jason Cole is a highly respected neurosurgeon who has it all - a lucrative career, confident charm, and the gift of compassion. But he also has a deep, dark secret. One morning, when he wakes up disoriented in a wrecked hotel room amidst several near-naked women he's never seen before, he knows one thing: it's happening again. Every night at the same hour, something inside Jason changes, leaving him almost unrecognizable - seductive, devious, borderline sociopathic. This new man is his dangerous alternate personality who goes by the name of "Ian Price." For years as he's battled Dissociative Identity Disorder (DID), Jason has been able to keep Ian in check with a powerful experimental sedative. But now his - their - body has developed a resistance to the serum, setting Ian free once again. And to make matters worse, after being suppressed for so long, Ian's hell-bent on taking revenge on his oppressor. With everyone Jason cares about at risk - patients, friends, co-workers and even the woman he loves - he's got to stop Ian once and for all. Will they find some common ground, or will they bring each other down? Hell hath no fury like an alter scorned. New York, NY – December 12, 2012 – AMC announced today the renewal of “Hell on Wheels” for a third season with John Wirth (“V” “Fallen Skies” “Terminator: The Sarah Connor Chronicles”) serving as executive producer and showrunner. Season three of the series has been greenlit for ten, one-hour episodes and is scheduled to premiere in third quarter 2013. Centered on the lawless town known as “Hell on Wheels,” that travels with and services the construction of the first transcontinental railroad, the series examines the railroad’s institutionalized greed and corruption, the immigrant experience and the plight of the newly emancipated African-Americans during reconstruction. “Hell on Wheels” second season wrapped in October with an average of 2.4 million viewers and 3.2 million viewers with Live plus 7. "We look forward to unveiling the next riveting chapter in the complex lives of the denizens of ‘Hell on Wheels,’” said Jeremy Gold, Head of Creative Affairs, Endemol Studios and executive producer, “Hell on Wheels.” "We are delighted that John Wirth will be joining us on this remarkable journey. John is a proven showrunner with a terrific voice and a deep passion for our show," Gold concluded. 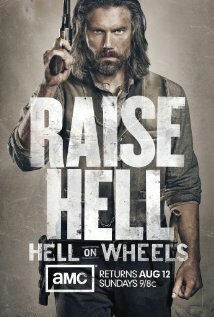 “Hell on Wheels” stars Anson Mount as former confederate soldier Cullen Bohannan, who is struggling to escape his demons from the recently fought Civil War. Colm Meaney stars as Thomas “doc” Durant, a greedy entrepreneur taking full advantage of the changing times, and musician/actor Common is Elam Ferguson, an emancipated slave working to achieve true freedom in a work entrenched in prejudice. “Hell on Wheels” received a 2012 Emmy nomination for outstanding original main title theme music. Mel B, Emma Bunton, Geri Halliwell, Mel C and Victoria Beckham appear on stage for the curtain call of Viva Forever the Spice Girls inspired musical. . Report by Kat Hayes. TV: NCIS: Los Angeles 4x10 Promo "Free Ride"
"Free Ride" -- Callen, Sam, Kensi and Deeks spend Christmas aboard an aircraft carrier investigating the death of a fellow NCIS special agent. Meanwhile, Nell and Eric make the most of the holidays back at headquarters and Hetty takes a trip, on NCIS: LOS ANGELES, Tuesday, December 18th on CBS. TV: Hart of Dixie 2x11 Promo "Old Alabama"
TV: NCIS 10x10 Promo "You Better Watch Out"
"You Better Watch Out" -- It's Christmas time and Tony DiNozzo can't decide if he'll be naughty or nice when his dad, Anthony DiNozzo, Sr., comes to town for a visit. Meanwhile, the NCIS team is "following the money" in order to solve a murder investigation, and Abby is bursting with excitement over all the holiday festivities, on NCIS, Tuesday, Dec. 18 (8:00-9:00 PM, ET/PT) on the CBS Television Network. Robert Wagner ("Hart to Hart") reprises his role as Tony's father. TV: The Big Bang Theory 6x11 Promo "The Santa Simulation"
"The Santa Simulation" -- Sheldon revisits some Christmas memories during a game of Dungeons and Dragons, while Penny, Bernadette and Amy try to find a girl for Koothrappali when he joins the girls for ladies' night, on THE BIG BANG THEORY, Thursday, December 13th on CBS. Blizzard exec Rob Pardo says console version of dungeon crawler "looking pretty cool," but still not an official project at the company. The actress ditches her underwear and accidentally flashes photogs while arriving at the "Les Miserables" premiere. Take a look. Music: The Rolling Stones comment on "One More Shot." Charlie Sheen's ex-wife is seeking treatment for addiction issues once again. Hear the latest. Gaming: Metro: Last Light Promotion - Free Metro 2033 Game for PC! THQ have just released the "Genesis" Trailer for Metro: Last Light. It is the most engaging yet, a mix of gameplay with a little teaser for release. What's also significant about this trailer is that the end tag contains information to receive a free Metro 2033 PC code. I'm confident that once people catch up with the Metro predecessor, they'll be clamoring for Last Light. So here is the trailer, watch it through to the end to get the link for the FREE Metro 2033 PC Download! The actor makes his red carpet debut following his shocking breakup with Katie Holmes. Hear about Tom's holiday plans. "Kahu*" -- After someone foolishly tries to carjack McGarrett, he and Catherine meet a boy whose father is missing and may be in deadly trouble in the backwoods of Oahu, on HAWAII FIVE-0, Monday, Decemer 17th on the CBS Television Network. George Takei ("Star Trek") guest stars. TV: 90210 5x10 Promo "Misery Loves Company"
Injured. Scattered. Hunted. Shipwrecked on an island off the coast of Japan, Lara Croft began armed with nothing more than her wits and will to live. Forced to forage for food and defend herself from hostile natives, Lara is forever changed when her friends are captured and she realizes she is the only one who can save them. Pushed to the limits of human fortitude, Lara knows that if she doesn't survive, none of them will. Watch Lara transition from "survival" to "Survivor" in our new trailer. Dr. Jason Cole is a brilliant surgeon with a serious problem: he shares a body with his worst enemy. Don't miss the premiere on January 31st! Carrie is faced with a pivotal decision, Saul undertakes a secret assignment, and Quinn has a decision to make that may prove to be a game-changer in the Homeland season 2 finale. To celebrate the release of U.F.O. staring the legendary Jean-Claude Van Damme on December 24th on Blu-ray and DVD we have got a great competition for you. 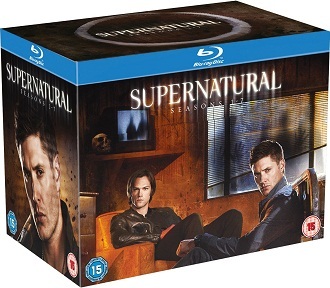 We have got 2 copies of the film on Blu-ray for you to win. A violent earthquake is followed by strange lights in the sky. All power has been cut across the planet. AS the clouds clear, a UFO appears, a UFO the size of a city. The attack has yet to begin but with no electricity, humanity is helpless in the face of a vast alien army. The battle for earth is drawn gear and everyone will need to fight not just for their own survival but for that of the human race. 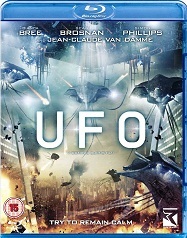 With a stunning cast that includes explosive new stars Bianca Bree and Sean Brosnan alongside Sean Pertwee (Event Horizon, Dog Solider), Julian Glover (Indiana Jones and the Last Crusade, The Empire Strikes Back), and action legend Jean Claude Van Damme (Expendables 2, Timecop), UFO is an action-packed sci-fi spectacular. Prepare for the invasion and try to remain calm... the fight against extinction is about to begin. The complete first to seventh seasons of the American fantasy drama about two brothers who battle supernatural forces. Sam and Dean Winchester (Jared Padalecki and Jensen Ackles) were raised to fight the paranormal by their father, John (Jeffrey Dean Morgan), after their mother was killed by a malevolent demon. Bound together by blood and tragedy, the brothers spend their lives battling a host of spirits, demons and other dark forces.